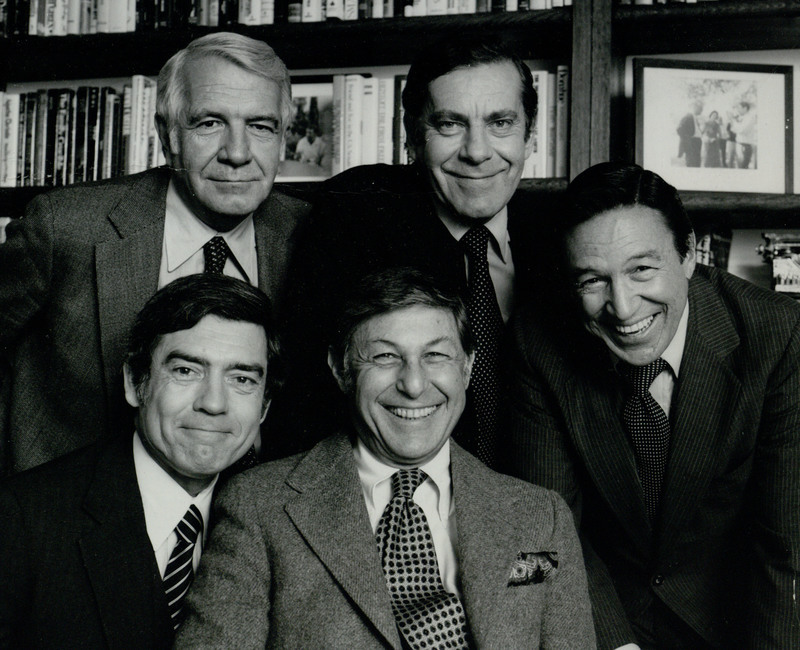 The 60 Minutes team with producer Don Hewitt and correspondents Dan Rather, Harry Reasoner, Morley Safer, and Mike Wallace. Rather (Dan) Papers, Box 82_0031, Howard Gotlieb Archival Center, Boston University. In the fall of 1975 Dan Rather joined the team of 60 Minutes and became the third correspondent with Mike Wallace and Morley Safer. While Don Hewitt’s show had been on the air since 1968, it had not fared very well, mostly due to erratic scheduling. Things changed in 1975, as the New York Times reported. The Federal Communications Commission amended its 1971 Prime Time Access Rule and decided that 7 p.m. Sunday could be used for other public services and children/family or news programming. While NBC and ABC went for the kids shows, CBS first decided to do the same by broadcasting Three for the Road, but too many of its local stations refused to carry it, due to a conflict with local news. The answer was to switch 60 Minutes to the 7 p.m. position from its previous 6 p.m., where it was often preempted for football games. With the new schedule came also the decision to change concepts and offer a year-round program with new shows fifty-two weeks a year, and, as a consequence, to bring a third correspondent on board. The Los Angeles Times reported on December 21, 1975, that Rather seemed the ideal choice: “He has reporter’s knack for being in the middle of the action.” Rather said he couldn’t be happier with the new assignment: “Working for Hewitt is a dream job . . . and I have immense respect for Mike and Morley. It’s like going to heaven before you die.” He also welcomed the deadline of the weekly show, as opposed to the uncertain and frustrating scheduling of CBS Reports. In a December 1976 issue of American Film, Stephen Zito described the show in the following way: “'Sixty Minutes' is a producer’s show. There are five producers assigned to each of the three coeditors. Each of these producers will spend between five and seven weeks doing research and preliminary filming on a story before the correspondents are brought in for the final week of shooting and scripting and editing. It is an economical way to work and allow a correspondent to cover a number of stories in a given year. Each correspondent has his specialty: Wallace is the caustic interviewer and pocket muckraker; Rather is best on domestic politics and investigative journalism; Safer is the essayist who covers domestic and world affairs in a highly personal style.” In 1979, the New York Times described how it was essential to Hewitt’s conception of the show “that viewers identify with the four on-the-air personalities: laconic Reasoner, combative Wallace, earnest Dan Rather, amiable Morley Safer." Between December 1975 and June 1981, Dan Rather worked on over 160 pieces with a group of talented producers, whom, as he explained in 1979, he considered his fellow journalists: “I abhor the word 'producer.' What I have is a team of five other reporters, every bit as good as I am, working with me.” All started with a "bluesheet," a short proposal for a story, and was followed by intense research, sometimes for months, to gather materials and look for interviewees and location shots. The correspondents had different levels of involvement, and Rather, who was regularly anchoring the weekend editions of the Evening News and participating in numerous CBS Special Reports as well as election coverage, trusted and relied on his producers. These included over the years Joel Berstein, Richard Clark, Joe Decola, Leslie Edwards, Steve Glauber, Marion Goldin, Irme Horvath, Esther Kartiganer, Andrew Lack, Paul Loewenwarter, William McClure, Harry Moses, Igor Oganesoff, and Jeanne Solomon. Producers remember how fierce the competition was among correspondents and producers. While some producers thrived in this environment, Marion Goldin recalls how it was quite discriminatory toward women. The show de facto changed television, especially television news, for better or for worse, depending on who was asked. The criticisms did not abate, and many worried about the impact on journalism, especially long-format documentaries, as 60 Minutes gave the impression that any major issue could be addressed in fourteen minutes. The show was accused of being more entertainment than journalism, of “being too slick, too shallow—a hit show, not a news broadcast.” As the Los Angeles Times explained in 1980, “exposing a fraudulent anti-poverty program is one thing; '60 Minutes' does that. Examining the root causes of poverty and exploring solutions to the problem is quite another; '60 Minutes' doesn’t do that.” But Hewitt always described his creation as “packaged reality,” characterized by a mix of hard and featured stories, modeled after the old Life magazine that Hewitt admired. By the late 1970s, the show was mature and confident enough to be subject of two 60 Minutes investigative pieces about itself and its techniques. The first one called "Looking at 60 Minutes," was produced by Marion Goldin who "dissected various practices that had come under some fire," while the second took viewers on a "Behind the Scenes" tour of the most successful show on television. This topic was revisited in 1982 with a "CBS News Special, Eye on the Media: Business and the Press," that aired on December 25. The debate, moderated by Harvard law professor Charles R. Nesson, with ABC's Geraldo Rivera, NBC's Brian Ross, and for CBS, Dan Rather, Mike Wallace, and executive producer Don Hewitt, answered questions about unfair treatment of business by the press. On the business side, Herbert Schmertz represented Mobil Oil and Howard P. Allen spoke for Edison, among others. Dan Rather received both praise for his hard-edged journalism and criticism for “virtually every transgression” ascribed to 60 Minutes, including superficiality, hype, gee whiz-ness, theatricality, and bias. He was also described in 1980 as “the new breed of television journalist - the reporter-as-performer-participant. The good-looking guy who gets personally involved in his stories, playing basketball with one interview subject and skin-diving with another.” Despite these criticisms, the press acknowledged his “impressive reportorial skills [and] his strong professional presence,” and many of his stories received or were nominated for journalistic awards, including Emmys, Peabody Awards, Robert F. Kennedy Journalism Awards, and Alfred I. DuPont Columbia University Awards. Rather achieved a different level of notoriety than during his time as a White House correspondent. He was on the cover of TV Guide, People weekly, and interviewed by Rolling Stone, for example, and rumors were circulating about a possible succession to Walter Cronkite as early as 1977. As Christopher Sterling put it in Encyclopedia of Journalism, “After four decades on the air, 60 Minutes has become the quintessential news magazine, and one that has avoided some of its competitor's problems. It has successfully melded hard and softer news and avoided the overall trend toward tabloid content.” In 1981, Ed Bradley replaced Dan Rather and correspondents have included, over the years, Lesley Stahl, Meredith Vieira, Scott Pelley, Bob Simon, Steve Kroft, Diane Sawyer, Anderson Cooper, and Christiane Amanpour. The first of so-called TV newsmagazines, 60 Minutes has influenced similar programs such as 20/20 (ABC, 1978– ), Nightline (ABC, 1980– ), and Dateline (NBC, 1992– ), as well as other CBS shows such as West 57th with Meredith Vieira and Steve Kroft, 48 Hours, which originally focused on showing events occurring over a 48-hour span, and, over strong objections by producer Don Hewitt, 60 Minutes II in 1999, an attempt to further expand the news magazine. Title card from CBS's "Where Are They Now?" Goldin (Marion) Papers, e_goldi_00006, Briscoe Center for American History. Title card of CBS's "George Wallace." Goldin (Marion) Papers, e_goldi_00014, Briscoe Center for American History. "Another Ripoff?" Blue sheet, February 1, 1976. Goldin (Marion) Papers, e_goldi_00060, Briscoe Center for American History. Leon Jaworski. Rather (Dan) Papers, Box 78 Folder 5_0018, Howard Gotlieb Archival Research Center, Boston University. Children's Rights publication, part of the investigation for CBS's "Take the Children and Run," Summer 1977. Goldin (Marion) Papers, e_goldi_00023, Dolph Briscoe Center for American History. Picture of Chris Carter in CBS's "A Family Affair." Goldin (Marion) Papers, e_goldi_00036, Briscoe Center for American History. On the set of CBS's "None of Your Damned Business." Scheffer (Phillip) Papers, e_scheffer_00004, Dolph Briscoe Center for American History. Still image of Dan Rather and gas station worker in CBS's "Highway Robbery," September 24, 1978. Still image from the opening of CBS "West Coast Story," December 10, 1978. Michigan statistics about disabled children. Scheffer (Phillip) Papers, e_schef_00027_001, Dolph Briscoe Center for American History. Title card of CBS's "PDAP." Scheffler (Phil) Papers, e_schef_00078, Briscoe Center for American History. Still image - opening of CBS's "Barbara Jordan," June 17, 1979. Picture of Dan Rather and crew in Afghanistan, 1980. Rather (Dan) Papers, Box 78 Folder 5_0033, Howard Gotlieb Archival Research Center, Boston University. Title card of CBS's "MS-13," which aired on December 4, 2005.